When talking of this simple bread recipe, I am not joking to tell that it takes even less than 30 min to make it. Of course, you cannot have it all ready just in half and hour. But, you can do your home choirs, work or play with your kids and occasionally take few minutes to make home bread. Warm up the water or milk, add the yeast, salt and sugar. Leave it for 15 min. Then mix in 5 table spoons of flour. Let it stay like that for about 30 min. That’s the first stage. It all takes up about 5 min of your time. 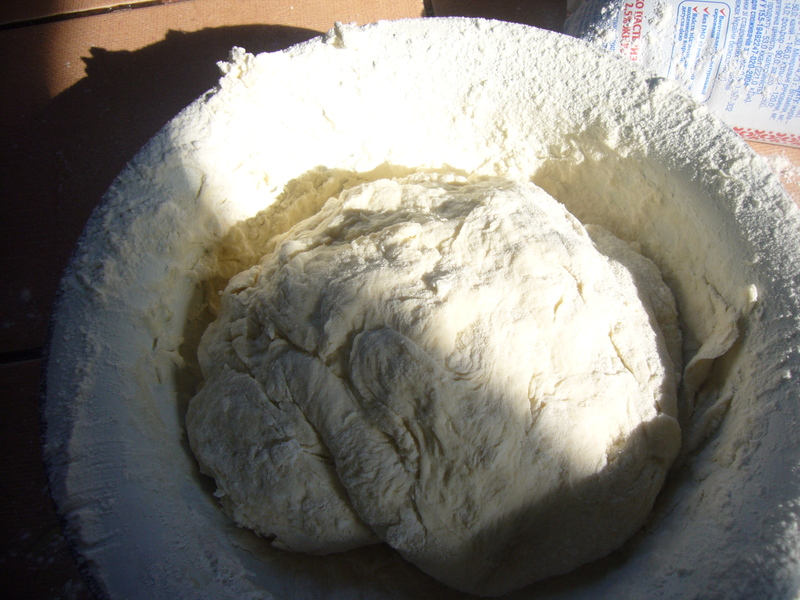 Then you mix in the rest of flour and knead dough with your hands for 5 min. 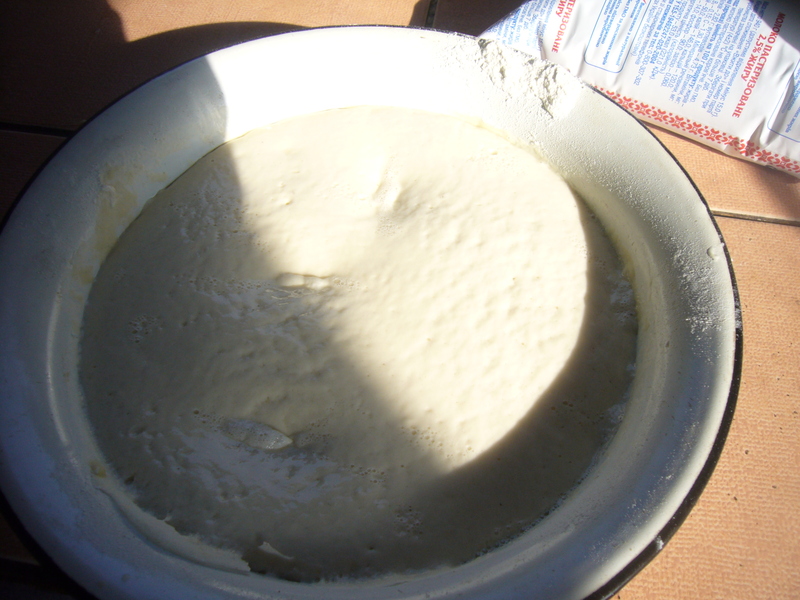 You keep on adding flour, until the dough stops getting stuck to your hands. Let it stay in warm place for up to 1 hour. It should rise. Again, you spend about 5 mins of your time to mix the dough. 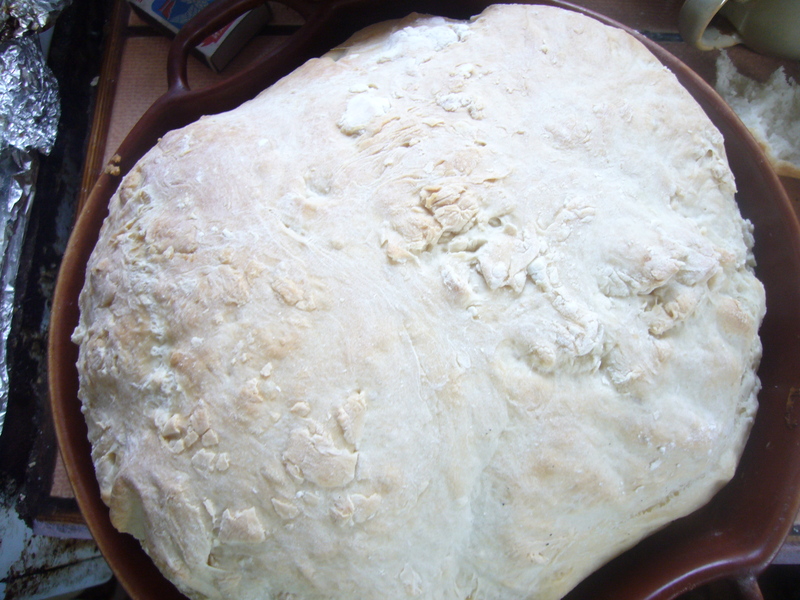 Then you knead it a bit once more and put it into your baking pan. This time you may also leave it to rise. I don’t. I turn on the oven and set the bread in it. It takes time for the oven to get heated up. This is the time your bread rises in it. Then it gets baked in about 20min. That is what I got. It does not look ‘dressy’. However, if you leave the dough to rise for the second time in the bread baking pan, you can glaze it with egg yoke, with melted butter or with olive oil. It will look much better, but it will taste the same. We never wait for the bread to cool off enough to get cut with the knife. It’s so delicious, that we just break it down with our hands and eat it! That’s a simply home bread recipe. It does not take you all day to make and it fills your house with a very sweet home kind of smell. This entry was posted in Easy Recipes and tagged baking bread, bread recipe, cooking tips, easy baking bread, easy dessert, flour, food, healthy cooking, home bread, home cooking, homemade, homemaking, housekeeping, tasty home recipes. Bookmark the permalink. This looks totally doable! 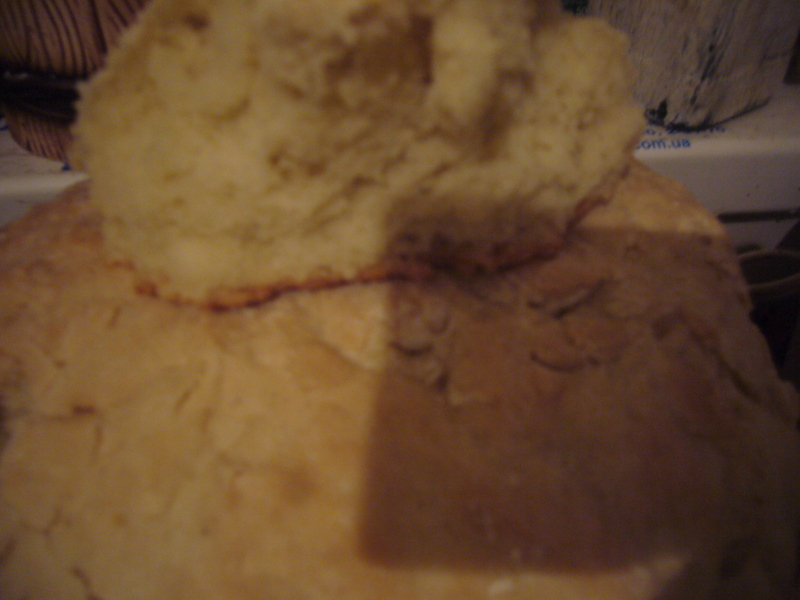 I am finding myself more and more intrigued by homemade bread making…. Yes, it is. I got this recipe from my babysitter. She used to bake all her bread and it was tasty. So, I decided to try it out, too.